Wich often painted on a(fieldgray) helmet around decal with a mild grey paint. I am also studie the kriegsmarine helmets. Intersting KM helmet picture...does the flash fool me? or do i notice something blue-grey. The photo on the link do you mean? If so, yes, does look blue/grey, certainly a darker slate grey, possibly blue/grey like you say. I personally would not take 7009 as a pre-war color. I find it to be light gray.I've always had good results with6003 along with a few% 6006. 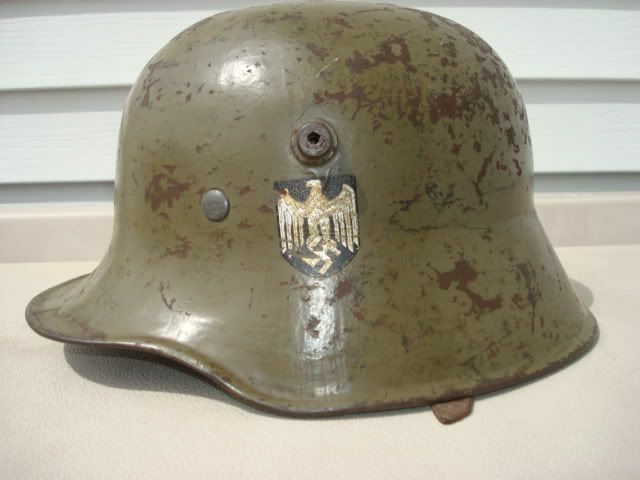 Most pre-war helmets that I saw all had a light green color. The gray color for camo kriegsmarine is the same color as the metal of the ship. The early green ones you have done are nice, but for me im trying to match a more of a tinned pea green like the 3 helmet of the pictures i posted. Could be a bit of work (and wasted paint!) before you get there though..! could this be a close match ? Mooyman - I still stand by RAL 7009 - it is light grey-green - see below. The one thing I am personally confident about though is that RAL 6003 Olive Green was not the early paint and it was never a shade used for factory helmets - only field used for Normandy schemes due to it's availability as a vehicle paint. Hans - also below is the RAL 7008 you mentioned - described here as Khaki-grey..?? Bottom line to me, is that - as I mentioned in my post a while back - there were so many variations in original paint, whilst it was all supposed to be the same colour/RAL for a given time-period, it varied widely in reality, so there is no absolute right or wrong. To me, if you personally are happy you have got a colour that falls within the wide spectrum of shades, then thats it, job done..! 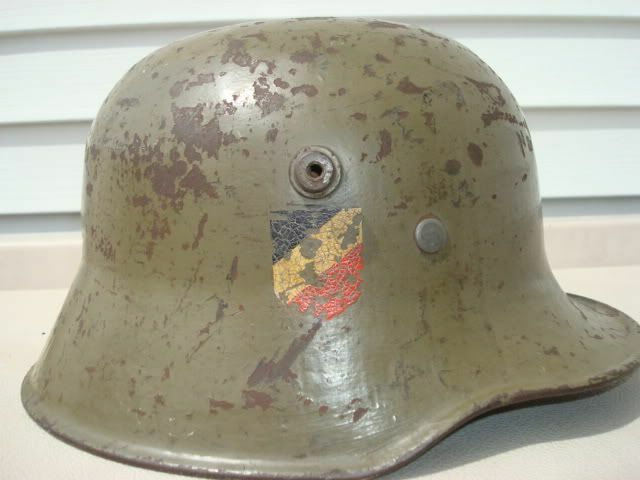 These photos that Hans put up earlier give a good illustration of how the shades varied widely - as per the June 1935 order, this M18 helmet has been repainted "light Field Grey" RAL 7009. As part of it's preparation for re-issue it will have been fitted with the new M35 liner and at the same time has been fitted with 3 new helmet retaining rivets factory finished in "light Field Grey" RAL 7009 - but although technically the "same colour", the shell and the rivets are quite different in colour..
[quote="Jagdpanther"]Mooyman - I still stand by RAL 7009 - it is light grey-green - see below. 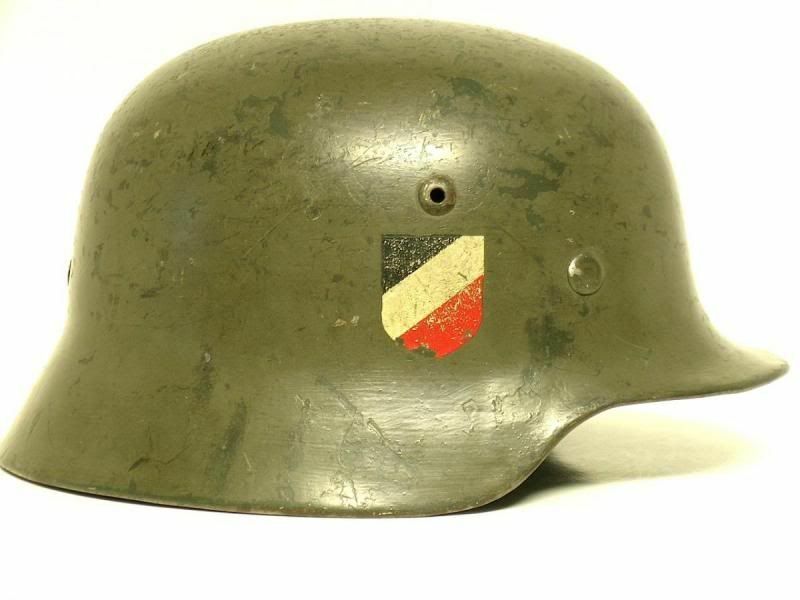 The one thing I am personally confident about though is that RAL 6003 Olive Green was not the early paint and it was never a shade used for factory helmets - only field used for Normandy schemes due to it's availability as a vehicle paint. I'm sorry but I don't recognize any green.It can be me be,or it's the flash. I have to stick on 6003,light-green even though there is no evidence. I don't say it's THE pre-war colour,but it looks like it. I've said this before but you are all on very dodgy ground trying to assess and match colours from what a PC screen shows you. All screens are different and unless both the original image and the screen you view it on are correctly colour calibrated then you will get no end of variations of how it appears to you! Some will see greenish, others greyish and still others brownish etc etc. I'm a professional designer and correct rendition of colour is a minefield - we send accurate proofs of jobs to clients with uncalibrated PCs and then have to explain that the colours they are seeing are not what will actually print!! For the early war green RAL 6003 would be quite the wrong colour as it was a vehicle overspray colour. 1) June 1935 smooth "Light Field Grey" (A.K.A. "Apple Green") RAL 7009 and double decals introduced for Heer helmets. 2) 27th January 1940 - OKH ordered helmets be painted in smooth , matt, slate grey , still double decal. This order applied both to factory production, and was also intended to be applied to existing Apple Green helmets, which were to be repainted slate grey. It is unlikely that many helmets were factory produced (or field repainted) in slate grey, as just 7 or 8 weeks later a new order went out re helmet colours, as follows..
3) 21st March 1940 - Helmets were to be painted in textured "Dark Field Grey" RAL 6006 with a single decal. Existing helmets were to be repainted to this same colour and single decal configuration (although many weren't!). The texture used was Aluminium Oxide. 4) 28th August 1943 - Heer Adler decal removed - henceforth all helmets were textured RAL 6006, without any decals. As there wasn't the same technology back then, as there is now, to ensure one batch of paint was identical to the last, shades/tones varied massively between factories and even between batches from the same factory. You can see this well on many early "Apple Green"/RAL 7009 M35 helmets - the 3x liner retaining rivets were made at a different factory to the one the helmet shell was made at - they arrived at the helmet factory already painted in RAL 7009, so should have been the exact same colour as the shell they were added to, but quite often they were a very different shade - so there is quite a wide spectrum of colours that qualify for the loose title "Apple Green" - from a light grey/green, through a pea green, sometimes more grey than green, sometimes more dark green - not far off the later RAL6006.... Therefore, "Light Field Grey" is a more accurate description of the colour than "Apple Green". So, when replicating this paint now, there is no absolute "right" and "wrong"...! 1) Initially in double decal, smooth RAL 7009 "Apple Green"/"Light Field Grey" - when they were repainted at depots etc, they generally had their original WW1 liners replaced by the new liner used in the M35 helmet. You can see evidence of this on the outside as they have the large helmet retaining rivets, instead of the smaller WW1 ones. 2) After 1940, and right up to 1943, large numbers were refurbished with new liners (if they hadn't already received them) and given textured RAL 6006 paint and a single decal. These were probably intended for second line use, but are occasionally seen on the front line on original pictures. 1) Initially double decal, smooth RAL 7009 "Apple Green"/"Light Field Grey". 2) From 27/1/40 should have been double decal, smooth slate grey, but probably rare. 3) From 21/3/40 should have been repainted with textured RAL 6006 "Dark Field Grey" with single decal. 4) From 28/8/43 Heer decal removed. 1) Initially textured RAL 6006 "Dark Field Grey" with single decal. 2) From 28/8/43 Heer decal removed. Kriegsmarine followed Heer regs re colour and decals on the same dates as above (although many field repainted various shades of grey for shipboard use). Luftwaffe M35/40/42 4th Nov 1935 onwards smooth RAL 7016 blue-grey, double decal (M35s only), from 12th June 1940 (so, for M40/M42 helmets) rough textured RAL 7016 blue-grey single decal. Sometime after Heer orders removal of eagle decal in 1943, Luftwaffe also removes it's eagle from helmets, so henceforth Luftwaffe helmets have textured RAL 7016, no decals. 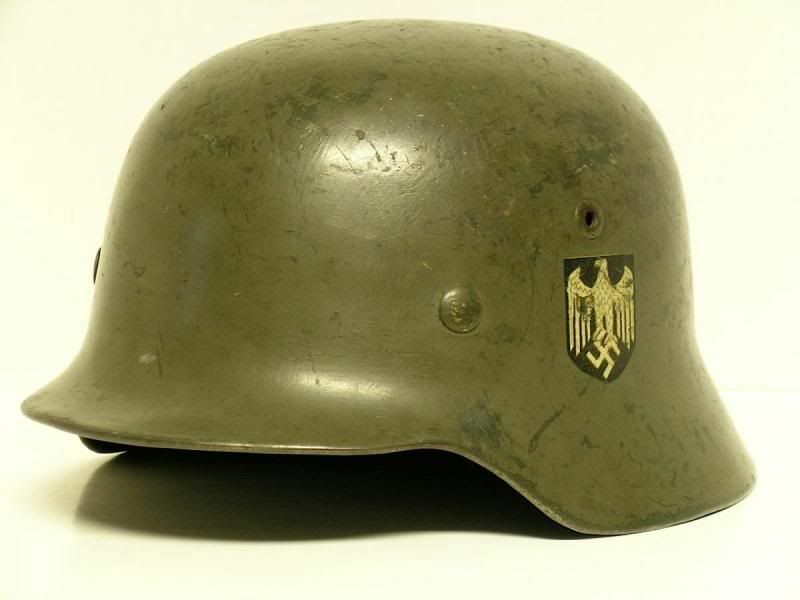 Luftwaffe Fallschirmjager M36/37/38 helmets Contrary to some popular belief, Fallschirmjager helmets were never (as far as I can establish) painted in Lufty blue/grey - they were always painted as per Heer regs - so initially double decal smooth "apple green"/"light field grey", then briefly double decal smooth slate grey, then single decal textured dark field grey, then textured dark field grey without decals exactly as per Heer regs above, and from same dates. For early war "light field grey" ("Apple Green") RAL 7009, I use Revell 67. For late war "dark field grey" RAL 6006, until recently I "D.I.Y. 'd" it, mixing 1 part black with 3 or 4 parts olive green (the other advantage of that is that no two of my late war dark field grey helmets are quite the same colour, which is quite authentic..!!) 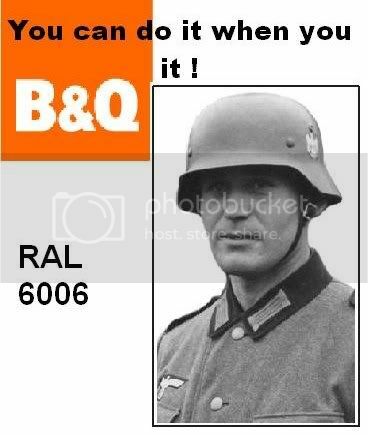 Some of my mates in GD Recon have also been off to B&Q and just asked for RAL 6006, and had it made up there-and-then in store...!! (You could no doubt do that with other RAL colours too..?) You can also get paint made up by people like http://www.paints4u.com, who can prepare RAL codes - just make sure to ask for it in a matt finish. I recently had my first tin of Matt RAL 6006 from them, and it is great. For Luftwaffe "Anthracite Grey" RAL 7016 I use Revell 9 "Anthracite Grey". RAL 7027 I use Humbrol 187 "Afrika Sand Grey"
RAL 8017 Red-Brown/Chocolate Brown - I have used Tamiya TS-1 spray paint, but this is no longer available unfortunately. It is worth noting that other items, for example the mess tin/cooking pot, were not painted in the same colour as helmets - mess tins for example were initially in slate grey, and later moved on to olive green, possibly RAL 6003. It seems that it was the same with gas mask tins. Very interesting study! What colour is used on the first helmet show in the pictures as this seems very close the the 'infamous' Apple Green, however if you are saying it is RAL7009 - this does not look close to RAL7009 (much more Grey), but the one in the last picture does! So just need to understand what pictures align with what colours! My understanding that Apple Green is not the same as RAL7009 - they are two different colour schemes BUT always open to debate on this! All three were painted in Revell 67 which I use for "light field grey" ("Apple Green") - which was RAL 7009 Grungrau as far as I can tell, but as you say, controversial whether it actually is RAL 7009..!! All three are all exactly the same colour, if they look different to each other, it is due to light etc..!